is considered to have the earliest account of the Bois Caïman ceremony. He was a surgeon at the Gallifet plantation who survived the insurrection and wrote about it in 1793-94, which was later published in 1814. 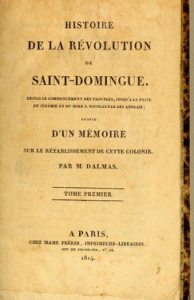 Antoine Dalmas, Histoire de la revolution de Saint-Domingue (Paris: Meme Frères, 1814), 116-127.
in his 1818 account, is assumed to have used Dalmas as his source for Bois Caïman but he is notable in being the first to include the oration of a priestess said to be present at the ceremony. 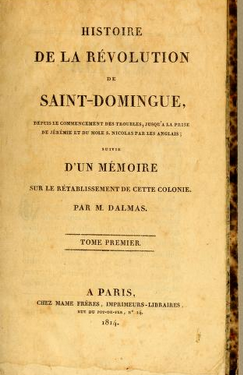 Antoine Metral, Histoire de l’insurrection des esclaves dans le Nord de Saint-Domingue (Paris, 1818), 15-20. 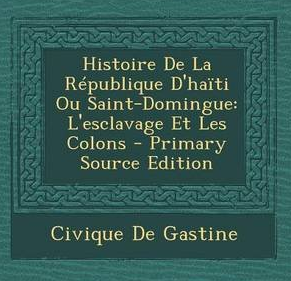 Civique de Gastine Histoire de la Republique d’Haiti ou Saint-Domingue, l’esclavage et les colons (Paris: Plancher, 1819), 104-106.
was a Haitian writer, poet, and senator. He travelled in Le Cap and wrote his version using oral accounts and is considered an original source, separate from Dalmas. He has been charged with adding some classical Greco-Roman theatrics to the Bois Caïman ceremony. He also has the earliest written version of the Bois Caïman speech. He watches us, he sees all that the whites do! The God of the whites pushes them to crime, but he wants us to do good deeds. Listen to the liberty that speaks in all our hearts. 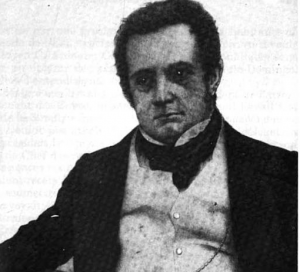 Herard Dumesle, Voyage dans le Nord d’Haiti, ou, Revelation des lieux et des monuments historiques (Les Cayes: Imprimerie du Gouvernement, 1824), 85-90.
was a French abolitionist whose 1843 account of Bois Caïman is the first to name Boukman in the ceremony. 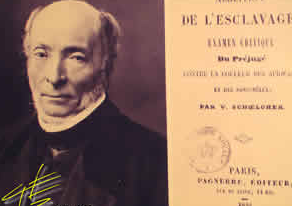 Victor Schoelcher, Colonies etrangeres et Haiti. 2 vols. (Paris, 1843; reprint ed., Point-a-Pitre: Desormeaux, 1973), 99. Ardouin, B. (Beaubrun). Etudes sur l’histoire d’Haiti: suivies de la vie du general J.-M. Borgella/ par B. Ardouin. Tome 1. Vol. 1. 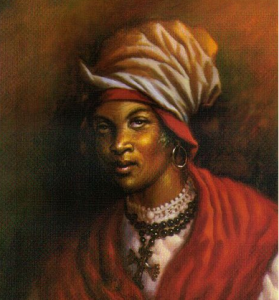 (Paris, 1853), 226-230.
identifies Cecile Fatiman, who was the daughter of an African woman and Corsican man and believed to be a mambo, as participant in the Bois Caïman ceremony. Etienne cites 19th century Haitian family papers. Etienne Charlier, Aperçu sur la formation historique de la nation haitienne (Port-au-Prince: Presses Libres, 1954), 49.
Letters from nuns in le Cap were compiled later but based on original “lettre annuelle de l’Ordre de Notre Dame.” There is reference to Boukman leading the insurgence towards Le Cap with vodou chants. R.P. Cabon, “Les Religieuses du Cap a Saint-Domingue,” in Revue d’histoire de l’Amerique francaise, vol. 3, n 3 (Dec. 1949): 417-19. 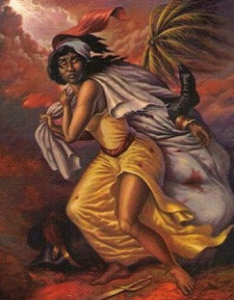 Laurent Dubois, Avengers of the New World: The Story of the Haitian Revolution, (Cambridge, Mass: Belknap Press of Harvard University Press, 2004), 100. David Patrick Geggus, Haitian Revolutionary Studies, (Bloomington [Ind. ]: Indiana University Press, 2002), 89. Laurent Dubois, and John D. Garrigus, Slave Revolution in the Caribbean, 1789-1804: A Brief History with Documents, (Basingstoke: Palgrave Macmillan, 2006), 88. Schutt-Aine, 91, and Geggus, Studies, 249-50, n. 9. 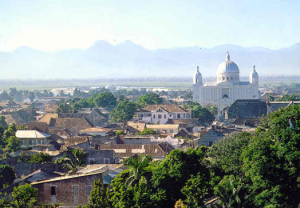 Carolyn E. Fick, The Making of Haiti: The Saint Domingue Revolution from Below, (Knoxville: University of Tennessee Press, 1990), 93.